Sherman Writes Atlanta’s Mayor Not “War is Hell,” but “War is Cruelty, and You Cannot Refine It.” He Explains Why All Atlanta Residents Must Leave and Outlines the Union’s Case Against the South. 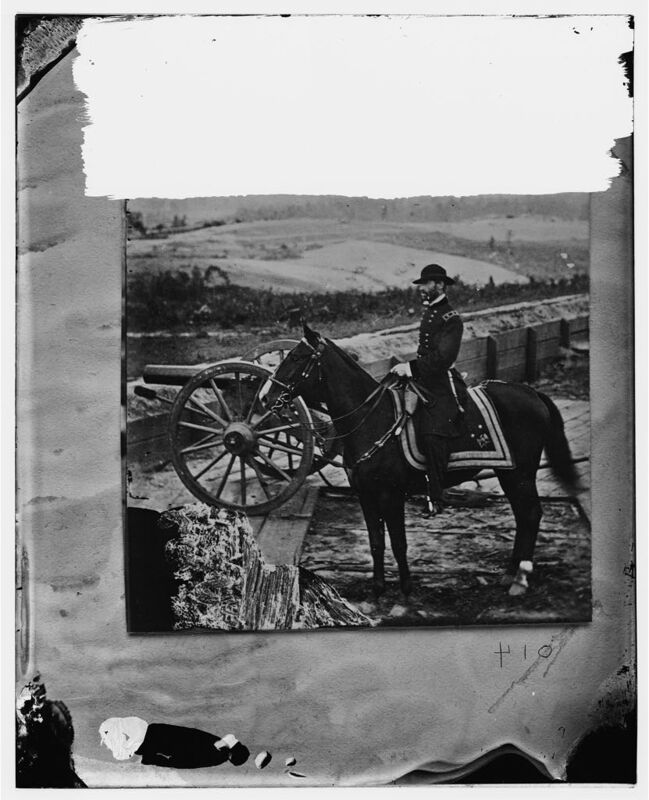 Major General William T. Sherman on Horseback near Atlanta between September – November 1864. Click on image to see the picture larger. Gentlemen: I have your letter of the 11th, in the nature of a petition to revoke my orders removing all the inhabitants from Atlanta. I have read it carefully, and give full credit to your statements of the distress that will be occasioned, and yet shall not revoke my orders, because they were not designed to meet the humanities of the case, but to prepare for the future struggles in which millions of good people outside of Atlanta have a deep interest. We must have peace, not only at Atlanta, but in all America. To secure this, we must stop the war that now desolates our once happy and favored country. To stop war, we must defeat the rebel armies which are arrayed against the laws and Constitution that all must respect and obey. To defeat those armies, we must prepare the way to reach them in their recesses, provided with the arms and instruments which enable us to accomplish our purpose. Now, I know the vindictive nature of our enemy, that we may have many years of military operations from this quarter; and, therefore, deem it wise and prudent to prepare in time. The use of Atlanta for warlike purposes is inconsistent with its character as a home for families. There will be no manufactures, commerce, or agriculture here, for the maintenance of families, and sooner or later want will compel the inhabitants to go. Why not go now, when all the arrangements are completed for the transfer, instead of waiting till the plunging shot of contending armies will renew the scenes of the past month? Of course, I do not apprehend any such thing at this moment, but you do not suppose this army will be here until the war is over. I cannot discuss this subject with you fairly, because I cannot impart to you what we propose to do, but I assert that our military plans make it necessary for the inhabitants to go away, and I can only renew my offer of services to make their exodus in any direction as easy and comfortable as possible. You cannot qualify war in harsher terms than I will. War is cruelty, and you cannot refine it; and those who brought war into our country deserve all the curses and maledictions a people can pour out. I know I had no hand in making this war, and I know I will make more sacrifices to-day than any of you to secure peace. But you cannot have peace and a division of our country. If the United States submits to a division now, it will not stop, but will go on until we reap the fate of Mexico, which is eternal, war. The United States does and must assert its authority, wherever it once had power; for, if it relaxes one bit to pressure, it is gone, and I believe that such is the national feeling. This feeling assumes various shapes, but always comes back to that of Union. Once admit the Union, once more acknowledge the authority of the national Government, and, instead of devoting your houses and streets and roads to the dread uses of war, I and this army become at once your protectors and supporters, shielding you from danger, let it come from what quarter it may. I know that a few individuals cannot resist a torrent of error and passion, such as swept the South into rebellion, but you can point out, so that we may know those who desire a government, and those who insist on war and its desolation. We don’t want your negroes, or your horses, or your houses, or your lands, or any thing you have, but we do want and will have a just obedience to the laws of the United States. That we will have, and, if it involves the destruction of your improvements, we cannot help it. Now you must go, and take with you the old and feeble, feed and nurse them, and build for them, in more quiet places, proper habitations to shield them against the weather until the mad passions of men cool down, and allow the Union and peace once more to settle over your old homes at Atlanta. W. T. Sherman, Major-General commanding. Reprinted in William Tecumseh Sherman, Memoirs of General William T. Sherman, vol. 2 (New York, 1875), pages 600-602. September 17, 1864. Radical Republican John Charles Fremont continued to feel that Lincoln was too slow and too moderate with regard to abolition, but he was appalled by the Democratic platform, which he described as “union with slavery. And so, on September 17, because he felt it was essential that McClellan be defeated, he, and in due course his War Democrat running mate, General John Cochrane, withdrew from the race. With Fremont no longer a presidential candidate and as the Union’s successes on the battlefield increased during the fall, McClellan’s chances of being elected declined.